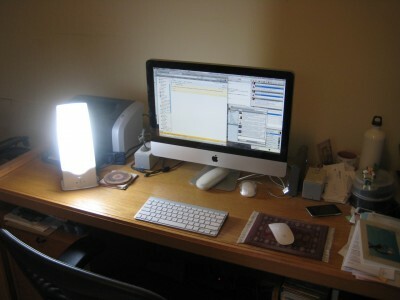 My dad and his wife gave me this light-therapy device for staving off SAD. I took advantage of the fact that my brother was off work for the holidays by playing a whole lot of StarCraft. My plan had actually been to continue that through today, but I got email from an editor expressing an interest in a story I’d finished a few days ago. I’d done my “final” rewrite of this story back in December. But one of my Christmas presents was the book Save the Cat, and reading it had crystallized a couple of aspects of story structure that hadn’t quite been clear before. So, I’d cracked the story open to do a bit of restructuring. Once the email arrived, I had to wrap that up right away. Fortunately, there wasn’t much left to be done. I did the restructuring pass in a couple of hours, made two editing passes to smooth off a few bits of awkward language, and sent the story off. So, a day early, the work year is begun.